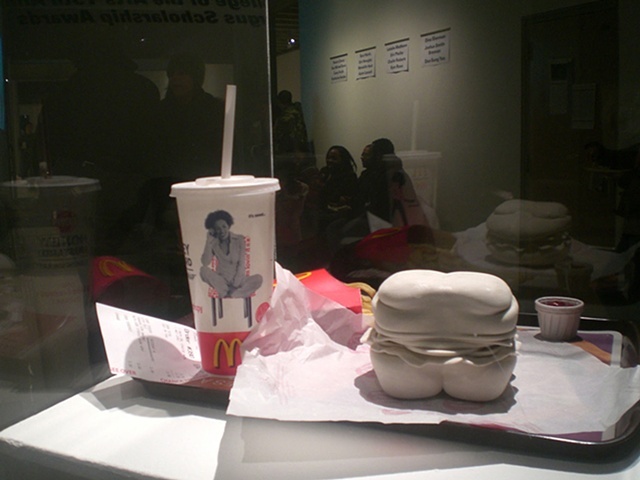 The form of a hamburger and fat human torso was combined within three-dimensional modeling software (Cinema4D) and then produced the physical model with the rapid prototyping process using printing software (Magics and ZPrint) with the rapid prototyping machine (ZCorp 510 Spectrum 3D printer). This concept of the different human body form provided a springboard for the concept of the Organ-machine Hybrids project series about changing human and animal body form in technological society. This piece points out a strange paradox of the human body’s damage and deform as negative side-effects of industrialized food production, and the human body’s redesign and expansion by the positive side of the technological advances. The piece illustrates that junk food’s negative influences on people and our society sparks a serious issue in the United States. Many companies that supply junk food target children for marketing profit. The result has been that many schools are now restricting vending machines in campus areas because children’s obesity is a nationwide problem. Based on the Government-Chartered Institute of Medicine, obesity in childhood more than doubled in the past three decades. Kids are also suffering high blood pressure, diabetes and other illnesses normally associated with adults. The piece promotes awareness of the harmful problems of consuming excessive junk foods. It suggests the results of an unbalanced diet while suggesting that alternative diets man allow one to maintain good health. Viewers enjoyed seeing these works with humorous perspectives, while receiving clear messages about the results of consuming too much junk food. This is a gentle way of delivering a serious message about our bodies and our health.